Stand on Sloto’s Podium With 350 Free Spins Pack! 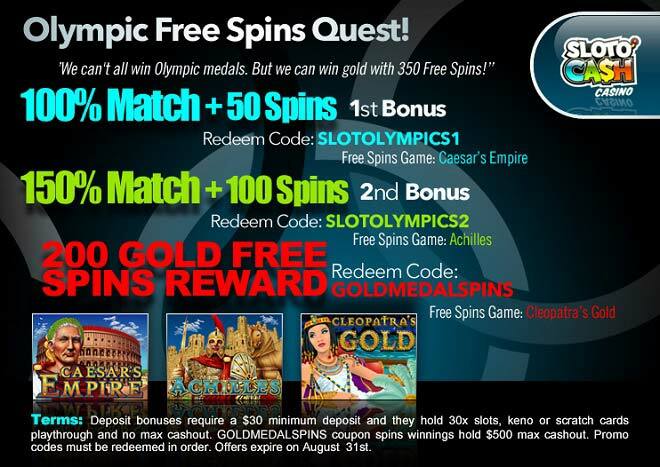 Some say winning isn’t everything – but you just wait until you’ve won with Sloto’s Olympic Bonuses and Free Spins! Deposit as little as $30 this August and you’ll be reaching your own Olympic pinnacle of wins! Spin the reels of our popular Caesar’s Empire, Cleopatra’s Gold and Achilles – three outstanding games that pay tribute to important figures in history! Watch this leader, ruler and hero come to life while you collect wins with the help of Wilds, multipliers and bonus features! Stand on Sloto’s podium after winning your own duo of bonuses and many Free Spins this August and celebrate your Olympic achievement with a hefty cash reward!